Here we are nine months post accident and there is so much to talk about! Last time I posted, Jennie had just undergone surgery to replace the boneflap removed to allow her brain room to swell. The surgery went exactly as planned and it was a super moment to no longer need the imfamous pink helmet. Jennie had to have her head shaved again to undergo this surgery and experienced expected swelling to her face and temple area. While this was somewhat discouraging for her, the swelling went down over the next several weeks and her hair has now grown enough to shape into a pretty cool and funky hairdo (that Jennie designs on her own...but more on that to come!). The week following surgery, Jennie started going back to therapy at a local rehabilitation center. Initially, she went to physical, occupational, and speech therapies three times a week. Shortly into going to therapies, her neurosurgeon (our hero!) released her from his care to a more regular doctor - a physiatrist - that helps with the rehabilitation process. Within a couple months, she met her goals in physical therapy and was able to phase out of that. At this point, Jennie has no physical limitations! She has been able to walk on her own for awhile now but her stride has continued to get smoother, her balance is much improved - she is able to wear her favorite Rainbow flipflops, and she was even swimming under water this past week. She takes care of picking out her own clothes, getting dressed, putting on makeup, and fixing her own hair into a fun, spiky style. While she is excited that her hair has grown out a bit (covers up any proof of stitches/surgery!) she still can't wait for it to grow to her shoulders and do some fun highlights (possibly at her new job...keep reading). One of the toughest things Jennie has had to deal with is her ability to communicate. Being able to find the right words she would like to say has been hard. She has been talking a good bit to our mom lately and just a few weeks ago she initiated her first conversation with me (to tell me that my son was flirting at the pool...haha). Her vocabulary is rapidly increasing and she is gaining confidence in talking with other people that she meets. Jennie now has a new Facebook account and cell phone and is able to operate both fairly well on her own. She uses an additional computer that has a program called "Speak-to-me" that allows her to type a word in and the computer will voice the word. As she continues to work on reading and writing, this has really helped to be able to identify what her friends write to her and know for sure the reply she would like to use. She is also able to recognize all letters/numbers on the keyboard and does recognize some words that are more common in conversation. Her handwriting is improving and she is able to copy words onto paper. As Jennie continues to get better, she has been able to regain a bit of a social life. She has gone to the movies a few times, has enjoyed the beach and pool, and is able to go out with friends to the mall and out to eat. Some of her future goals are to get a part-time job, have easier more in-depth conversations, learn to drive (long-term goal but she is really excited about this one! ), and continue to work towards living more independently. In the last couple weeks the process has been started to get her into vocational rehab. This is the next step in working towards getting a job and continuing speech and occupational therapies. Jennie will be assigned an assistant of sorts that will be close in age to take her on outings for about 10 hrs. per week. Once she gets a job, she will also have an assistant that will stay with her as long as needed to help her learn her job. The director of a local company that offers these assistant services had an initial meeting with Jennie a couple weeks ago. She was super impressed by Jennie and learned that she loves fashion and always had a new style hairdo. The lady immediately thought of a good friend that owns a salon downtown for a possible job opportunity. Jennie made a great first impression and will start volunteering there a couple hours a week to see what she is able to handle and hopefully will grow into a real job. She is very excited about it...it's a job that is doing something that interests her, it's in a cool location and Jennie told me that they play great music. Since being home from Atlanta, many blessings have come Jennie's way. However, many of these opportunities mentioned above have happened because of an enormous amount of hard work on behalf of our mom. She has worked tirelessly to see to it that Jennie gets every opportunity possible. None of this has come easy for anyone, especially Jennie. Despite how extremely tough this process has been, Jennie has remained in the best of spirits. Sometimes she gets impatient about returning to normalcy, gets a little upset about her hair or how hard it is to talk to people. But for all she's been through, we are so proud to see how strong she has remained. She has no need for any medications, has no problems with seizures (a common issue with brain injury), and truly does have a good quality of life that is continuing to getting better. There have also been opportunities for Jennie and our family that have allowed each of us to give back and offer support to other families dealing with a similar situation. Most recently, Jennie was invited by the Shepherd Center (the rehab center in Atlanta that Jennie spent 4 months) to attend a symposium on brain injury at our local hospital. She was able to encourage some of the very nurses and therapists that worked with her in her first few weeks post-accident just by being there and showing the possibility to live a quality of life after such a severe injury. Thank you for continuing to follow along on Jennie's Journey! We are always in need of prayer - specifically: improvement in conversation, reading, writing, and the new job opportunity at the salon. 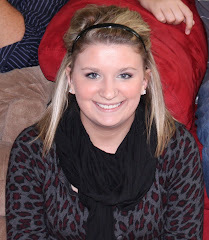 Jennie Savickas, now age 22, was in a very serious car accident the day after Thanksgiving 2009 in Wilmington, NC. She suffered a traumatic brain injury that required immediate surgery on the left side of her brain to remove a blood clot. After multiple complications, she has defeated all odds and is currently in a state-of-the-art brain injury rehab center in Atlanta, GA - The Shepherd Center. Jennie's Journey has been nothing short of a miracle.